Eco City Farms not only brings food back to the urban landscape, but also works to educate a new generation about eating well and urban farming. A good portion of Prince George’s County in Maryland lies just to the east of the Washington, D.C. city line, well within the Beltway. It’s a densely populated suburban region that is predominantly African-American, immigrant and working class in character. Tucked away between the region’s strip malls and modest houses is ECO City Farms, a nonprofit educational urban farm. On a solitary acre in Edmonston, Maryland, ECO City Farms houses four hoop houses, some beehives and a small flock of chickens. Food production is highly intensive and, unusual for the area, happens year-round. In their first growing season they harvested 600 pounds of fresh produce—everything from heirloom tomatoes and strawberries to kale, arugula and chard. ECO City farms was founded in 2010 and intends to act as an urban agriculture model. The farm is as serious about sustainability as it is about intensive farming and local food production. They rely on solar and geothermal sources for all their power. Crops are grown without pesticides or petrochemical-based fertilizers from organic, non-GMO seed. Compost and worm farming, or vermiculture, are important aspects of the farm’s activities. Many people in the greater D.C. area first discover ECO City Farms through its presence at the Riverside Farmer’s Market, where it sells its wares just like any other vendor. The farm has also begun to sell its produce to a handful of restaurants and food co-ops in the area. The farm also offers two seasonal CSA programs to choose from, one in the summer and one in the winter. But it turns out that the farmer’s market and CSA programs are just the tip of the iceberg. 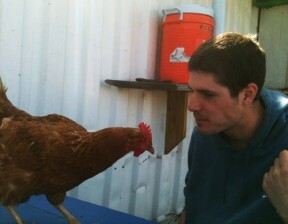 ECO City Farms offers a plethora of educational and community programs. The farm has hosted a community seed exchange and urban beekeeping meet-ups. It also offers various training programs for urban farmers, including one specifically targeted toward immigrant farmers—and another intensive program culminating in a certificate in urban farming issued in conjunction with Prince George Community College. Despite all these activities, ECO City Farms is a lean and mean organization. Margaret helms a four-person staff, plus a horde of well-organized volunteers, interns and students. Margaret noted to The Washington Informer that until relatively recently, much of the land in Prince George’s County was still farmland. Now Edmonston in particular is one of the poorest and most polluted communities inside the Beltway, a region rife with with obesity and diet-related diseases as well as documented food deserts devoid of supermarkets or other sources of fresh produce. In a sense, then, ECO City Farms is pointing both to the future and to the past of Prince Georges County, returning the land to food production using modern intensive methods with sustainable goals. In October of 2011, ECO City Farms announced that it was expanding its farmland to incorporate a plot of land next door that used to be covered by asphalt tennis courts. The organization hopes to provide an ongoing “de-paving demonstration” that showcases what can be grown under previously paved-over land. The expansion also allows ECO City Farms to install what they call the FOODShed, a converted shipping container that acts as a commercial kitchen, plus an outdoor area for classes, demos and community gatherings. Other plans include installing a sustainable aquaculture tank filled with tilapia and a direct-sale farmstand so that visitors and the surrounding community can buy directly from the farm. October 2011 also saw the unveiling of a public mural at the entrance to ECO City Farms. Painted by Matthew Gifford and titled “Cultivating Community/Cultivar La Comunidad,” the mural depicts clean water, earthworms, honeycomb, and fresh growing fruits, flowers and vegetables—all embraced by diverse hands. Like the farm itself, the mural creates concrete connections between food and community, making ECO City Farms’ mission instantly visible and recognizable to the people it serves.